Jack Ross has heaped praise on Charlie Wyke, suggesting it isn't always about goals for a striker. Wyke endured a tough start to his Sunderland career, which had brought criticism from some sections of the Wearside support. Soon after his summer move from Bradford City, Wyke was ruled out from September to December with knee ligament damage. As he regained full fitness, a slow start to 2019 followed, however Wyke has came to the Black Cats' aid in recent weeks. 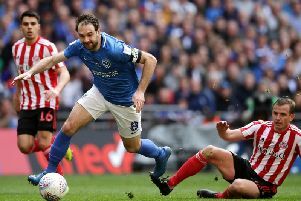 At Wembley, it was Wyke's assist that allowed Aiden McGeady to send the game to penalties before he was selected to start alongside Will Grigg at Accrington Stanley in midweek. Wyke and Grigg's two-man strike partnership inspired Sunderland to a 3-0 win, where the 24-year-old left the pitch to the travelling fans singing his name. Now, the former Middlesbrough man could be set for a busy end to the season as Ross decides whether to stick with two up top. When asked if Wyke did everything but score at Accrington, Ross said: "Yeah, and in all honesty, it'd take that performance level. "I know he's a striker and he'll be judged on goals but we need players like that. His contribution to the team is terrific. "I was pleased for him because it's been a frustrating season for him for a number of reasons. "Even in recent games when coming off the bench, he had an impact on us scoring. "I'm pleased he's been able to put that together over the course of the 80+ minutes he was on the pitch. "It's encouraging to have him in that form for these remaining league games then it's a bonus for us."